The following paper will consider the theme of the utmost degree of love and devotion to the Prophet Muhammad which among the mystics is characterized as “annihilation in the Prophet” (fana’ fir-rasul). In Sufi thought the two terms, fana’ and baqa’ are used as pairs in order to illuminate their respective qualities. “Fana’” in English is sometimes translated as “annihilation” and when indicating the role of a spiritual seeker, this may allude to the idea of the loss of self-identification or ego consciousness in the awareness of something far greater and encompassing. Annihilation (fana’) of a person is the person’s extinction from perceiving his own servitude (‘ubudiyyat), and subsistence is the person’s subsistence in witnessing Divinity (ilahiyyat), i. e., it is an imperfection to be conscious in one’s actions that one is a servant, and one attains to real servitude (bandagi) when one no longer regards the actions as his own, but is annihilated so as not to see them, and becomes subsistent through beholding the grace of Almighty God. Hence, all one’s actions are referred to God, not to one’s self, and whereas a person’s actions that are connected to himself are imperfect, those that are attached to him by God are perfect. Once the God’s servant is annihilated from his own attachments, he subsists through the beauty (jamal) of Divinity. al-Hujwiri’s Kashf al-Mahjub further relates fana to safa—“being pure from all existing things”. al-Hujwiri quotes Ibrahim ibn Shayban, an early Sufi, who says, “the knowledge of annihilation and subsistence (fana’ and baqa) turns on sincerity (ikhlas) and unity (wahidiyya) and true servitude; all else is error and heresy”. al-Kalabadhi (d. 995) also spoke of fana and baqa. For example, he describes how there are two kinds of people in the station of fana’; some who should not be followed as models since they are absent from their own attributes, although they are preserved in their duties to God, and others who are leaders to be followed since they have the qualities of subsistence (baqa’) and manage their affairs though the divine qualities, not through their own attributes. We later see the polarity of fana’ and baqa’ expressed in the teaching of the Naqshbandi Sufi Shaykh Ahmad Sirhindi (d. 1625), author of the well-known collection of letters, Maktubat In Sirhindi’s formulation, baqa was associated with the station of the Prophet who returns to the world and humanity to work for social and spiritual upliftment after having passed through the state of annihilation or self-effacement (fana’) in the realization of the divine. Recently scholars of Islam in the West have been debating the origin and emphasis of the doctrine of devotion to the Prophet in Sufi thought. Some have identified it as symptomatic of a modern reformist attitude moving away from the idea of mystical union in the divine through accentuating the personality of the Prophet and the study of his sayings, the hadith. 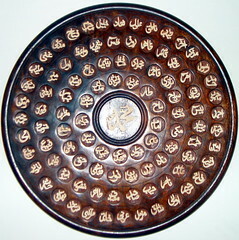 In response, others have tried to show that the idea of the Prophet as the Perfect Man and a particular object of devotion is an early and persistent theme in Sufism which can be traced to certain doctrines of Ibn ‘Arabi which were given a practical as well as a philosophical articulation in the works of ‘Abd al-Karim al-Jili (ca. 1408). I might further add that even in the case of later Sufis this emphasis on the veneration of the Prophet does not diminish the emphasis on trying to draw nearer to Allah, it is rather a means to this end. When it comes to the issue of the source for these concepts, it must be emphasized that the Sufis of the past drew on the Qur’an and the hadith for their understanding of the Prophet, augmented and interpreted of course by their own spiritual experience. For example, an early work such as the Kitab al-Tawasin of Mansur al-Hallaj (922) may be seen in part as a commentary on Chapter 53 of the Qur’an (al-Najm) which elaborates the spiritual role of the Prophet disclosed in its symbols. According to Ibn ‘Arabi’s interpretation the Qur’an’s commendation to the Prophet that he has a noble nature (khuluq ‘azim) is a reference to the perfection of Muhammad’s realization of his own original nature, created upon the divine form. This process of coming to manifest the Divine Attributes is known as “takhalluq”. This verse certainly represents devotion to the Prophet and the connection between this love and following the the injunctions of the Islamic law (shari’a). In addition to these Qur’anic verses whose outer meanings clearly point to the spiritual effects of utmost love and devotion to the Prophet, there are many esoteric allusions in the Qur’an as well as many citations in the hadith referring to this spiritual role. Some of these will be mentioned during the course of this paper. Sufis have often commented on the meaning of hadith such as “Whoever sees me has seen his Lord”, which discuss the results of love for the Prophet and developing the connection to him. shabam-ra tab-i mah avardehi tust! It is you who has brought the illumination of the moon to my night. Having made these introductory points, in the following part of this paper I would like to discuss some theoretical and practical dimensions of the doctrine of fana’ fir rasul or the utmost degree of love and devotion for the Prophet. I will first discuss some of the Sufi expressions of the concept of fana fir-rasul. What does fana’ mean? In Arabic it conveys the idea of “passing away” or “annihilation”. For example in Sura al-Rahman the Qur’an says “everything upon earth is perishing and the face of God remains” (55:27). We have shown that early Sufis used the concept of fana’, but the specific connection of fana’ with devotion to the Prophet was only gradually elaborated in their writings. Thus it can be asserted that in early Sufism, the precise expression “fana’ fir-rasul” was not used, although allusions implying such a concept can be traced, especially in post-Ibn ‘Arabi (d. 1240) writings. An important step in this process was the articulation of the Prophet’s exemplary station using the expression “al-insan al-kamil”, indicating the idea of the perfect or complete human exemplar. By the time of al-Jili this had become a concept capable of extensive philosophical and doctrinal articulation of the Prophet’s role in an exemplary and ontological sense. A further aspect of this doctrine is the high rank of Muhammad among the Prophets and the Perfect men is demonstrated, according to Ibn ‘Arabi, by the hadith in which Muhammad says that he was given the all-comprehensive words (jawami’ al-kalim). These words, according to Ibn ‘Arabi, represent the names of Allah and indicate the all-inclusiveness of the message brought by Muhammad and why he will be the master of humanity of the Day of Resurrection. This indicates that the religion brought by Muhammad comprises all other revealed religions and that he is the most perfect of perfect men. In addition it is interpreted by “the Greatest Shaykh”, Ibn ‘Arabi, as referring to Sufi practices of devotion to the Prophet. Another element of doctrine connected with the fana’ fir-rasul concept is the relationship between the divine plane (lahut) and the human plane (nasut) as mediated by the Prophet. Thus, while humanity forms a barzakh—boundary or point of mediation—between the spiritual and the material worlds, in the sense that Adam is composed of both the earthly matter and the divine spirit (ruh), the Perfect Human being, i. e., the Prophet, constitutes the Supreme Barzakh (al-barzakh al-a’la). In Sufi tafsir and terminology this relation of the barzakh is coded in the Qur’anic references to the “maraja al-bahrayni yaltaqian, baynahuma barzakhun la yabghian.” (al-Rahman 55:19-20). “He has given freedom to the two great bodies of water so that they might meet, yet between them is a barrier which they may not transgress.” The two seas here are said to represent the higher and lower realms, or the divine and human levels. .Many scholars translate "fana'" more technically as "annihilation" in the sense of loss of self-consciousness or identification. For a discussion of this terminology and its early development see Gerhard Bøwering, "Baqa' and Fana'" in Encyclopeadia Iranica III (London: Routledge and Kegan Paul, 1983-), 722-44.
al-Hujwˆrˆ, Kashf al-Ma˙j¨b, trans. R. A. Nicholson (London: Luzac, 1976), 245. I have modified the translation slightly. Ibid, 246. al-Hujwˆri says about al-Kharraz that, "he was the first to explain the state of annihilation and subsistence, and he comprehended his entire doctrine in these two terms. p. 242.
al-Kalabadhˆ, Kitab al-Ta…arruf, trans. A. J. Arberry, (Cambridge: Cambridge University Press 1935), 144-5. For studies of Sirhind^ and his thought in English see Yohanan Friedmann, Shaikh A˙mad Sirhind^, (Montreal: McGill University Press, 1971), J. G. J. ter Haar, Follower and Heir of the Prophet: Shaikh A˙mad Sirhind^ (1534-1624) as Mystic (Leiden: Het Oosters Instituut, 1992), Fazlur Rahman, Selected Letters of Shaikh Ahmad Sirhindi. (Karachi: Iqbal Academy, 1968). See, for example, Fazlur Rahman ed. Selected Letters of Shaikh Ahmad Sirhindˆ, (Karachˆ; Iqbal Academy, 1968), pp.31-61. Beginning with Gibb and continuing through Fazlur Rahman, and John Voll. For a good example of this see O'Fahey, R. S. Enigmatic Saint: Ahmad ibn Idris and the Idrisi Tradition. Evanston: Northwestern U. P., 1990, pp. 1-9, and the more recent article "Neo-Sufism Reconsidered" by O'Fahey and Radke in Der Islam (LXX,1):52-87. Valerie J. Hoffman, "Annihilation in the Messenger in the Writings of al-Jˆlˆ", unpublished paper", p. 5. I am indebted to Professor Hoffman for sharing this valuable paper with me before its publication. "Man ra'anˆ fa qad ra'a al-˙aqq". Bukharˆ, Ta…bˆr Muslim Ru'ya, and others. This is often translated as "Whoever sees me (the Holy Prophet in a dream) has seen truly". i. e., Only the Prophet can take on his own form in dreams, and therefore if he appears in a person's dream it is deemed to be veracious..
From Armaghan-i Óijaz (Gift of the Hijaz) n Kulliyat-i ash…ar-i farsˆ Maulana Iqbal Lah¨ˆri (Tehran: Kutubkhaneh-i Sana'ˆ 1964), 449. For example in Fuß¨ß al-Óikam ed. Ab¨'l-…Ala …Afˆfˆ (Beirut: Dar al-kutub al-…arabˆ, 1980), p. 55. See my article, "Pattern and Meaning: The Paradigmatic Structure of the Adam Stories in Qur'anic Narrative," Studies in Religion 17 (1, 1988): 41-52 for a discussion of Adam's nature as a combination of these aspects. Chittick, p. 30 Also pp. 125-143 on the Supreme Barzakh. The barrier is also mentioned in Qur'an 25:53.